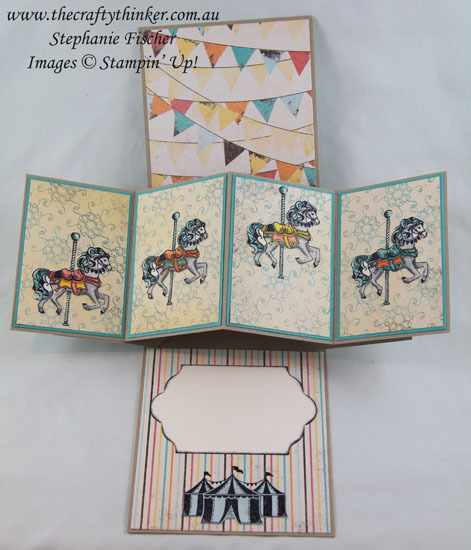 I love the Cupcakes & Carousels Designer Series Paper and have been guilty of storing it rather than using it: #loveitchopit !! 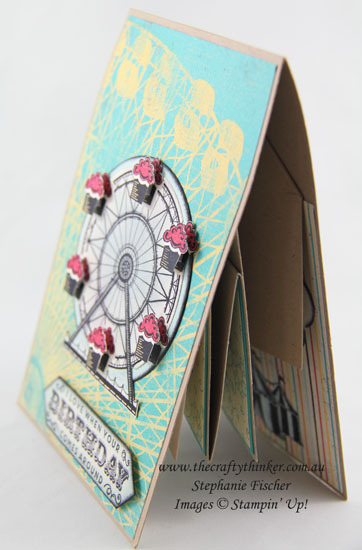 I also had a spare Twist & Pop card left over from demonstrating at our last card-making gathering. 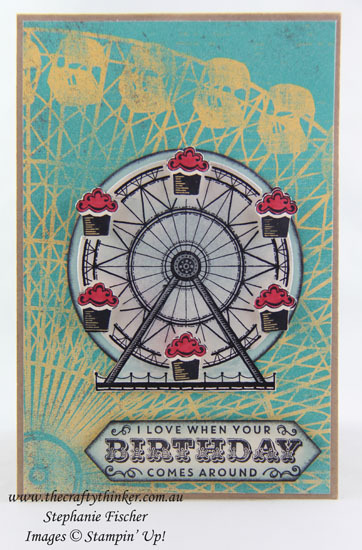 The image and greeting are stamped with Basic Black ink onto Very Vanilla card. I added some sponging with Soft Sky ink as well as some edging with Basic Black ink. I partially cut the ferris wheel with a Layering Circle die (using the Out of the Box technique to preserve the cupcakes) and adhered it to a larger Soft Sky circle that I'd edged with black ink. I stamped, coloured and cut more cupcakes and popped them into position with little pieces of Foam Adhesive. 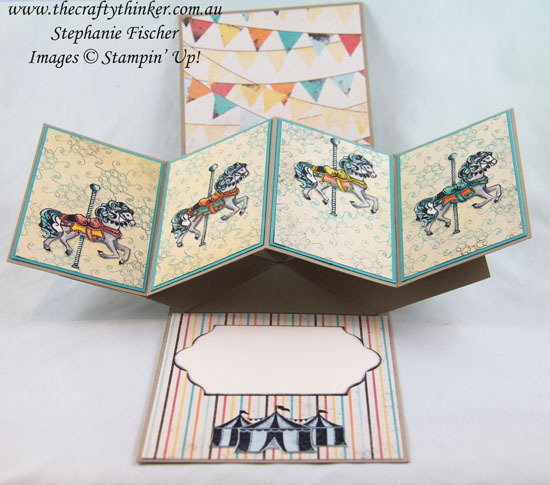 I decorated the inside of the card with more of the Cupcakes & Carousels paper as well as some Bermuda Bay layers on the four central panels. I stamped the horse four times with Basic Black ink on Very Vanilla card, coloured them with Watercolour Pencils and an Aqua Painter and then cut them out. I did give the poles, the manes and tails a base coat with a Soft Sky Stampin' Write Marker before adding a little shading with the Bermuda Bay Watercolor Pencil. I stuck them to the panels at different heights to (hopefully) give the impression of the horses going up and down on a carousel. 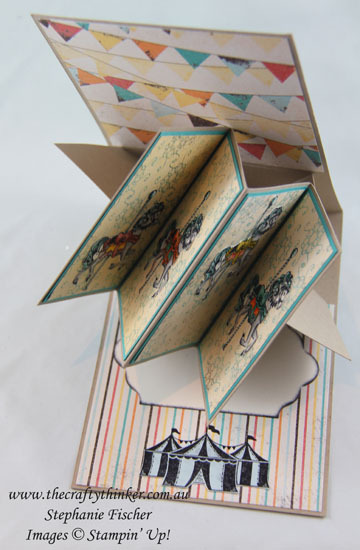 I stamped the tents with Basic Black ink onto the patterned paper and then again onto Soft Sky card. I cut around the Soft Sky tents and glued them into position. The area of writing a greeting is a piece of Very Vanilla card, cut with one of the Lots of Labels dies and edged with Basic Black ink.